This autumn sees the publication of the fourth edition of The Backpacker’s Handbook. The first edition came out in 1991 so the book, to my surprise, is now twenty years old. I’ve extensively updated it for this new edition with information on new fabrics like cuben fibre and new developments like heat exchanger stoves, wood burning stoves and modern airbeds. The digital revolution is in there too with computer mapping, smartphones, GPS and digital photography plus social networking and blogs, none of which existed twenty years ago, or even, for much of it, six years ago when the third edition came out. When I wrote the first edition much more that we now take for granted didn’t exist either – flipping through it I see there was no merino wool, no Paramo or eVent waterproofs, no Primaloft, no quilts, no titanium gear, no LED lights, no GPS, no digital anything. Silnylon almost creeps in with just one mention of “elastomer silicone-coated” flysheets and Gore-Tex and Therm-A-Rest were well established though. Of course whilst gear has changed enormously backpacking itself hasn’t. Gear is still the means not the end, or should be. When I think back to backpacking trips it’s not the sleeping bag or stove I used that first comes to mind but the wild land and nature and the pleasure in being out there. The purpose of my book is to enable others to enjoy this by finding equipment and techniques that work well so they can ignore them and get on with enjoying what it’s really about. 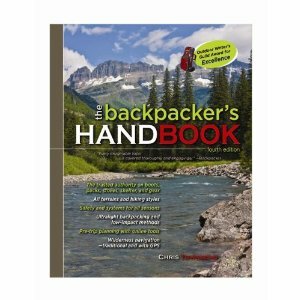 The Backpacker’s Handbook is published by Ragged Mountain Press. November 1st. The book is out and in the shops now. I have a copy of the first edition. Looks like I'll need to update it now! Chris - it's great to see this a new edition of this book! I wish people in the states read it more - the previous edition is full of sound lightweight backpacking advice. OK - ordered from Amazon, and it's on the way. Maybe you should set up an affiliate link? I appreciate the comments in your book about hiking solo. I rarely find anyone who understands why I like to go alone and your words exactly express my feeling about this issue. Next time someone says to me (with a look of serious concern and/or horror), "You are going alone?" I might be better able to articulate my experience. I read your 3rd edition, can't wait to get the 4th. Definitely my favorite book on the art of the backpacking.